Simple and versatile electronic load ! 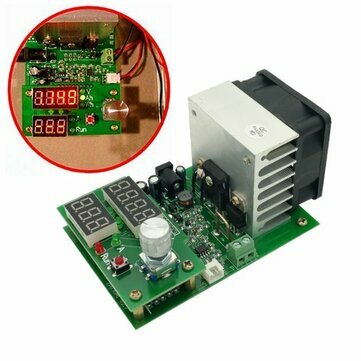 Automatic memory function with all parameters, is well suited for automated assembly of the power adapter aging cabinet. In the sale of the latest version, slightly larger size and upgrade the fan into the original high speed dual bearing fan , higher cooling redundancy, more suitable for long hours! Note: This product is a professional testing equipment , requiring the user must have some basic electronic ( example: Users should understand what is the meaning of the voltage and current capacity Ah , etc. ) , or you may be unable to properly use the device , possibly mishandled cause unnecessary damage caused by the test device loss! Power supply requirement: DC12V voltage (actual voltage 11-14V) current is not less than 0.5A of power, the power will be displayed inappropriate " Err6"
Note: The default power adapter is not included, the shell of 110W will be upgraded to silver color ! Positioning hole locations: 60mm x 88mm, diameter 3.2mm, 5mm pedestal already installed. Protection: Overheat protection "otP", transient overpower protection "oPP", overpressure protection "ouP", reverse polarity protection, power supply voltage abnormal protection. Hold down the start-stop button ( red button ) to the tester simultaneously energized until the key is released showing Fun * When, by rotating the knob to change the setting, "Fun1" for electronic load mode, "Fun2" battery capacity test mode. Push button start and stop at the buzzer after entering the settings, also set "bEon" buzzer by turning the knob to open or "bEoF" buzzer closes After setting press the button again to start and stop at the tester restart. 1. Turn on the power supply 12V boot into electronic load mode , ensuring in a stopped state ("RUN" does not light, otherwise the press of the start-stop switch to turn off the load ) connected to the power supply under test to the test port input power (P + P - ), pay attention not to take the wrong polarity! 2. Set current and lower voltage knob, turn the knob to set the value of the current setting position, then press the knob to change the setting digit, digital middle two digits to the right of the indicator and digital indicator VA simultaneously determine the current set position. 3. Press the start-stop switch, load began to run, "RUN" lights, power is applied to the circuit under test is set to enter the discharge current, while the upper display the actual input load voltage, when the voltage drops below the set limit voltage " RUN " LED flashes and short beep alarm buzzer accompanied. 4. The test procedure can be modified at any current, and if you need to modify the lower voltage to stop the load can modify. Note: When in alarm state, can only transfer a small current does not increase! Tester automatic power-down feature to save enough to save the set parameters and run state, when the state again after power transmission will complete before the power failure and restore data. 1. The test battery should be fully charged with a special charger! 2. Give the tester is powered into the battery capacity test mode, connect the battery current line to P + P- positive and negative terminals, if you use four-wire clamp test, while the four-wire interface to the positive and negative voltage test fixture is connected to V + V - port. 3. Turn the knob to set the discharge current and discharge voltage ( referring to two specific methods : 2 Description ), one press after setting the start and stop switch, a battery tester and a first line detection, automatic identification 2-4 line ( 2-wire line identification presentation JS-2,4 identification JS-4, if an error please stop the test and check the wiring ), then enter the test, if the fault code appears, refer to later explain. 4. The testing process will round up digital noticeable battery voltage, current, and the current discharge capacity Ah discharge energy Wh, when the discharge end ( battery voltage is below the set voltage ), the tester displays the data stays in Ah and blink rapidly , with bee shortness buzzer alarm. 5. Press the start and stop at the knob or switch to stop the alarm, you can turn the knob to view the battery discharge data, including discharge capacity Ah, Wh and discharge energy platform voltage V, start-stop button is pressed again, clear the data back to the initial setting interface before testing the next section batteries. 1. Battery test process can adjust the discharge current, if you need to re- adjust the termination voltage, you can pause by pressing the switch at the start and stop the discharge modification ( pause discharge will return to the settings page, this time discharge data is not lost , if necessary, you can long press clears the data until the start-stop switch 0.000Ah). 2. Tester automatic storage can record setting parameters, and record all parameters and status at the end of the test process and test power failure alarm status, re- transmission of all automatically restored. Err1: ultra-high capacity test the battery voltage. Err2: battery voltage is below the set termination voltage is not connected to the battery or the battery is reversed. Err6: working power is inappropriate, use a standard 12V power supply, and the supply current is not less than 0.5A. oPP: under ultra-high power electronic load mode instantly. 110W: the shell will be upgraded to silver color !